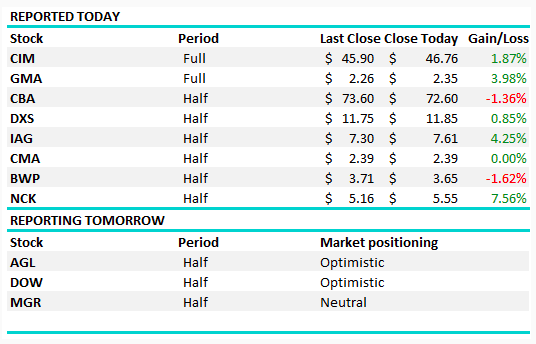 The market crept higher again today, continuing with the momentum gathered yesterday, albeit at a slower pace. The banks dragged however that was offset by some decent buying in some of the beaten down names (retailers etc.) while we also saw some good moves continuing in the tech space. 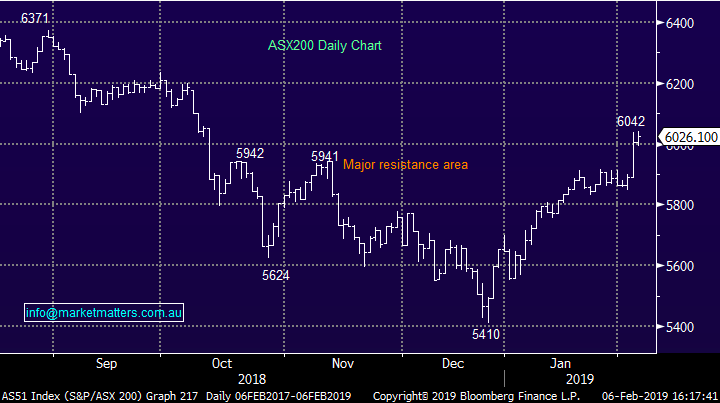 Resources rallied however CSL provided a drag after a Credit Suisse downgrade – the stock down ~2% highlighting that it only takes one less positive call to knock these high value stocks around. The reserve bank downgraded growth expectations yesterday then moved to a more neutral stance on rates today. The AUDUSD quickly fell ~1% as low ball Lowe put the boot in! Trump also took to the podium today, with the President addressing congress for the State of the Union speech. It was largely as per programmed with Trump sticking to his strengths in the economy, border security and foreign policy. Reporting;Main focus was the CBA result which we discussed in the Income Report today. As a quick recap, the result was soft with slowing income growth and poor treasury markets, missing expectations by around 2%. 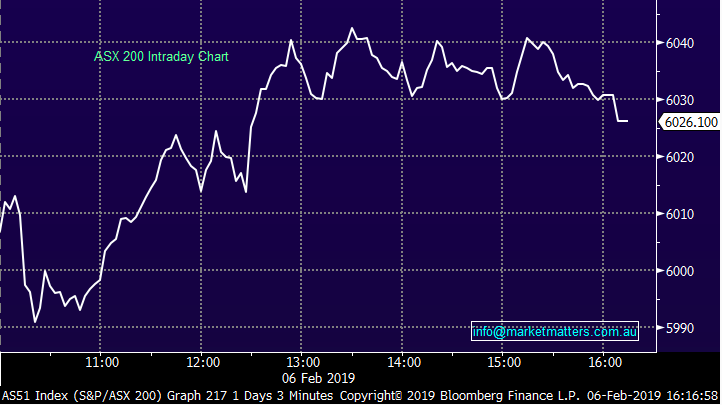 All the banks traded lower today as a result – and likely some profit taking after yesterday’s rally, all finishing over 1% lower. 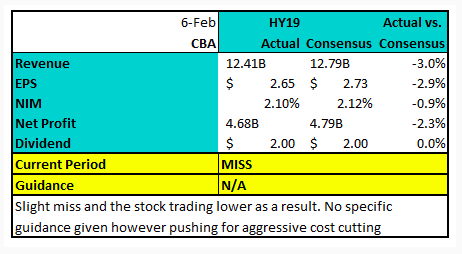 CMA: Reported 1H19 Funds from Operations of $26.5m, in line with expectations while FY19 guidance reiterated at FFO/Share of 18.7¢, with DPS of 17.6¢. BWP: Reported Distributable income of $57.4m slightly above expectations while guiding to dividend growth of +1.7% - including the payout of capital profits. All were fine, BWP is simply too expensive and fell as a result. Nick Scali (ASX:NCK) defied the general gloom in retail reporting solid numbers, profit for the half of $25m versus $23m expected by the market. They reported ~10% top line revenue growth with profit up ~8%, all a result of new store rollouts. Same store sales were flat and they didn’t give guidance, which they generally save for their AGM. 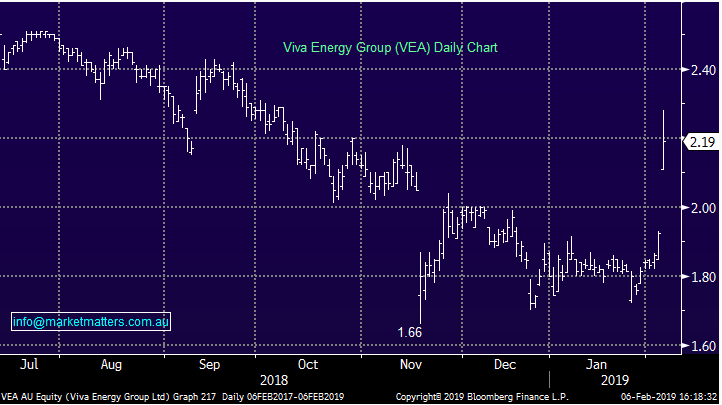 Viva Energy (ASX: VEA) +13.77%; The struggling petrol station IPO of 2018 has been dealt some respite today with the announcement of a new fuel deal with Coles (ASX: COL). The biggest IPO of 2018, which only briefly traded above its IPO price of $2.50, and traded to a low of $1.66 late last year, has bounced 13% today on news of the 10 year deal with the Coles convenience business. The new deal changes the relationship from a supply contract into a commission model where Viva will have the pricing power, and Coles will receive a rate on each litre sold. The deal ensures each company’s specialty becomes their responsibility, with Coles focusing on convenience for the consumer, and Viva to focus on fuel retailing, aimed at delivering “a more competitive customer offer… and better align contributions and incentives for each party.” Coles reiterated that convenience remains challenging in the first half with EBIT expected to be $47-$51m for the 6 months, a small portion of the Coles group earnings. We struggle to see value in either of the names above at this stage. Coles margins continue to come under pressure, and Viva’s problems won’t be solved with just this one new deal with refining margins yet to be inspected.